The IAF contingent – comprising six Flankers, two Illyushin IL-78MKI tankers and one IL-76MD transport – initially arrived at Mountain Home AFB in Idaho on July 17. The fighter pilots of No. 20 Lighting Squadron from Pune underwent a three-week familiarisation with training rules, and flew missions against the 18th Aggressor Squadron from Eilson AFB, Alaska, and the resident 366th Fighter Wing. The IAF moved to Nellis AFB on August 9. “To observers’ dismay, and no doubt to that of the US intelligence community, the IAF flew with a number of handicaps," writes Dave Fulghum of Aviation Week. The Su-30MKI’s powerful Russian-made NIIP-BARS radar was operating only in the training mode which limited the sensor’s range and spectrum of capabilities. The self-imposed radar restrictions prevented US snoops from "mapping" the high-tech radar. But other restrictions were dictated by the hosts, Fulghum writes. The Indians were barred from using data-links, chaff and flares. When they were targeted by surface to air missiles, they were shot down. There was no data picture in the cockpit to help IAF pilots’ situational awareness so the work load on the aircrews was high. Also, the IAF’s most powerful air-to-air missile, the R-77, was not simulated in the exercises. Col Fornof is an F-15 pilot and the Director of the Requirements and Testing office at the United States Air Force Warfare Center, Nellis AFB. The video was of a private briefing days after Red Flag 2008 to a group called the Daedalians – a group of retired American military pilots. In fact, Col Fornof is mistaken on several counts. For instance, the Su-30MKI does not have a Tumansky engine but rather an NPO-Saturn power plant. He is wrong again about the MiG-21 Bison having Israeli radar when in fact it has a Russian scanner. He’s wrong on most counts and in fact economical with the truth in some places. Som adds by the time the exercises at Mountain Home had matured the IAF had graduated to large formation exercises which featured dozens of jets in the sky. In one of these exercises, the blue forces, of which the IAF was a part, shot down more than 21 of the enemy jets. Most of these `kills’ have been credited to the IAF. Pushpindar Singh Chopra, editor, Vayu Aerospace Review, believes the Americans downplayed the Sukhoi’s capability because the alternative would be to acknowledge the IAF had spooked the USAF yet again. The IAF insisted on a 60-second interval for a very valid reason. When a jet takes off, the resulting turbulence can kick up foreign objects from the runway, which may get sucked into the engines of the aircraft taking off behind it. Now, the Su-30MKI engines are serviced in Russia. What the Russians do when a damaged engine arrives from India is they send a brand new ‘courtesy’ engine as replacement while the old one is being repaired or serviced, in order not to impact the IAF’s readiness. If only real combat was that easy. The colonel wrongly assessed the Sukhoi’s rate of turn at 22-23 degrees but he also made the startling revelation that the Raptor’s was 28 degrees. Did he unwittingly reveal classified information? At any rate, the Sukhoi’s rate of turn – with thrust vectoring – is considerably superior at 35 degrees. 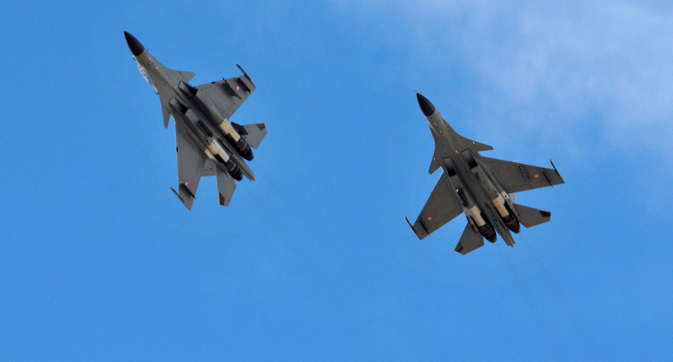 It is acknowledged in aviation circles the Flanker is a class above the F-15. In Fornof’s own view a well-flown F-15 can trouble an F-22; so a properly flown Flanker can potentially kill a Raptor in a knife fight. The best outcome of Red Flag 2008 was that it was a unique experience for Indian pilots who were keen to observe the USAF’s Net-Centric Warfare operations. “You cannot survive today for long against a good adversary without NCW capability," said then IAF vice chief Air Marshal P.V. Naik. As for the Americans, they also got a chance to get rides on the Flanker, “a thrilling opportunity especially for the local pilots” according to the military aviation website, Milavia.